Designed especially for use as a primary relief device on large stationary pressurized storage containers the base is supplied with a two inch NPT threaded container connection. 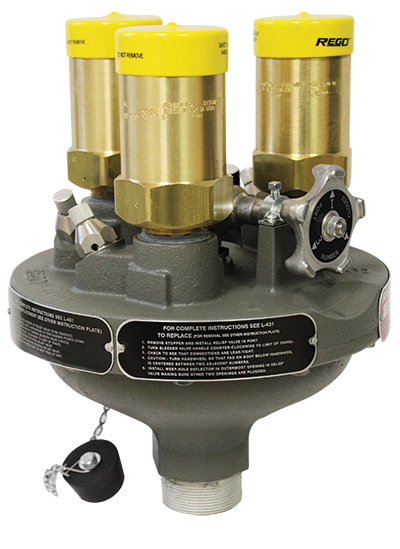 These manifolds incorporate an additional relief valve, not included in the flow rating, allowing for servicing or replacement of any one of the relief valves without evacuating the container. The hand-wheel on the manifold selectively closes off the entrance port to the relief valve being removed while the remaining relief valves provide protection for the container and its contents. All manifold flow ratings are based on flow through the relief valves after one has been removed for service or replacement.